How to Choose the Best RC Boat Under 100 Dollars? It is a known fact that, sometimes, we don’t want to spend more than 100 bucks on a “toy” like a remote control boat. However, the fun and happiness it brings are incomparable. Although most quality and full-feature brands come a bit pricey, the best option for newbies is to start small. Meaning, they do not need as many requirements to enjoy a wonderful day on the beach or in the backyard pool. An RC boat will deliver a pleasurable experience because you will be able to take your adventure to new heights. You just have to remember that before buying an RC boat, you should go through the features to be aware of the limitations and benefits for you to end up with the right boat. Also, the selection should be done as per your skill level and the type of maneuvers that you would like to make. Today, we want to point out two RC boats that are a very nice entry point for you. They are both available under $100 and promise that you can make the most of your investment. If you’re looking for a fast boat for intense racing, then the UDI007 Voyager is an excellent option! You’ll be able run this boat at up to 18 mph, leaving racing competitors in the dust. As a self-righting boat, it’s also able to keep itself from sinking without the need to manually correct it. Using the 2.4GHz controller, you’ll be able to easily race against others even if they have the same model. If you’re keen on tricks, the Voyager is also great for doing flips and making sharp turns. When the battery is running low, you’ll also get a warning so that the boat doesn’t just stop in the middle of the water. Make sure that anyone running this boat is over 14, or has adult supervision. This boat can also take on damage if used in salt water, so it’s best to run it in fresh water conditions. With a convenient single-prop 370 size motor that is water-cooled, you’ll be able to get a lot of power and fun out of this device. The UDI007 is a great option for the older user who wants to race and do exciting tricks. Due to the speed it offers, it may not be the best for younger users who need something that is slower and easy to control. This 3.1-pound product is recommended to be used by individuals from age 14 years old and up. It is equipped with a brushed motor and a 2.4GHz radio system that are both powered by the boat’s 1500mAh battery. It also has two propeller blades that make it look more realistic. Amazingly, it can reach a maximum speed of 19+ miles per hour (MPH). Likewise, its acceleration will also be disabled once it reaches an area without water. Such is made possible by the water sensor incorporated. There is a low possibility that this boat will get lost in the waterless area. It can be used on lakes, river, and pool without any issues. The length of the boat is 17 inches. 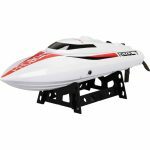 The Pro Boat React 17 Self-Righting Deep-V Brushed RTR Vehicle is a good choice if you want to have an RC boat that will be safe to use even in places that have a lot of waterless areas. 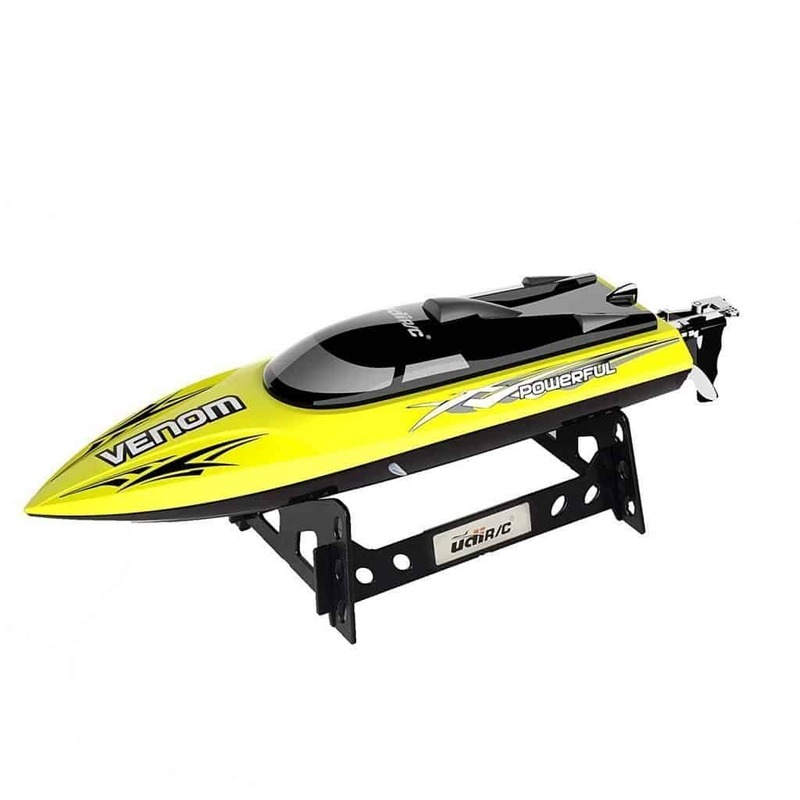 The water depth permitted by the RC boat is important since it is the parameter that will determine the visibility of the product from a long distance. The boat should come with enclosed propellers or small jets. That is because propellers might be caught through various objects like seagrasses, debris and fishing lines. The rudder should be enclosed, but for electric motors, it should be omitted completely. You should be aware of the lowest center of gravity so that you can make the most of your investment. The batteries should be swapped very easily so that there will be great productivity. Nonetheless, most of the current generation boats are fitted with NiMH batteries. You should be able to change the boat’s speed without hassles. If the boat only has an on-and-off functionality, then, opt for another one. Are you hungry for more in-depth reviews of the best RC boat out there? If yes, we also created a very long list of the newest and best-rated RC Boats in the industry.